Progress 111 / 367 miles. Hooray we are getting traction, I have broken the 100 barrier. The problem with running more than 6-8 miles is that eventually you run out of pavement, and sometimes you really don’t want to be roadkill and sometimes you just don’t want to go on back like you should. 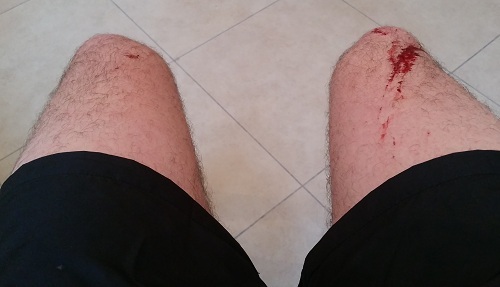 So once I ran through some brambles, I really underestimated them. As one of my colleagues who say on my left pulled out of the marathon so my other colleague who sits on my right, decided to step in, with zero training. Frankly he is a bit crazy and he is from Iran. He comes with me for the midweek runs and generally suffers alongside me gamely, his name is Payman, and man is he going to pay. tempo – which is jogging slightly above your average pace so you cannot easily hold a conversation, but you arent blowing! I have a half marathon this Saturday, its going to be interesting! Currently aiming to do that in about 2.15 if all goes well! Don’t forget I am running for a great cause…. the Sparks Children’s Charity, http://www.sparks.org.uk/about/ helping more money be invested into pioneering medical research for small children. If you agree with this, and you are able, then donate here: http://uk.virginmoneygiving.com/RobertElbourn Additionally Deutsche Bank are going to be matching anything that you raise to help me reach my target of £2,000.